In 1993, the introduction of the Royal Oak Offshore brought about additional change, introducing a compelling new twist to the iconic Royal Oak. The Offshore pushed the boundaries of watchmaking even further, offering new materials, new sizes, and sportier functionality. A stainless steel case with an attractive ivory and brown dial make for an unbeatable combination inspired by the great outdoors. Selfwinding watch with date display and center seconds. 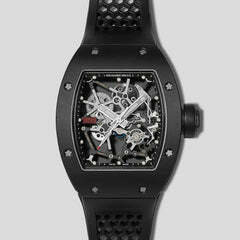 42 MM stainless steel case, black dial, white gold applied hour-markers and Royal Oak hands with luminescent coating (black minutes hand), black or silver-toned rotating inner bezel with diving scale and zone from 60 to 15 minutes in black, black rubber-clad screw-locked crowns, black rubber strap with stainless steel pin buckle. Power reserve of 60 hours. Water resistant to 300 meters. This particular example from 2013 is in mint like-new condition. 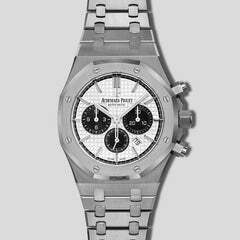 This timepiece comes complete with all accompanying boxes, manuals, and original warranty from Audemars Piguet.